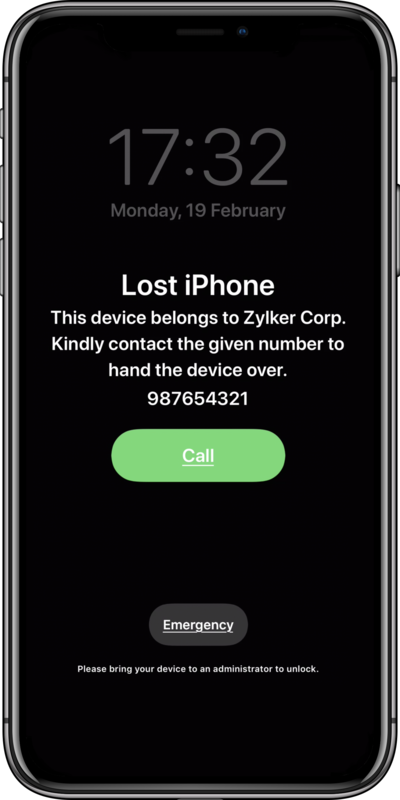 Mobile Device Manager Plus can be used to secure data in the mobile devices even in the event of the device being lost or missing. The following operations can be done using the security commands in MDM. Select the device that needs to be locked. Under Actions, click on Remote Lock. You can specify the message only if the device is running on iOS 7 or later versions. Enter the contact number and the message that needs to be displayed on the locked screen of the mobile device. You can see the message displayed on the device as shown below. Scan now: You can scan the enrolled mobile device to view device details, detect any blacklisted apps etc. You can also view the installed apps and the restrictions imposed on the device. The scanning can be performed only when the device is connected to the internet. This feature is applicable for Android and Windows devices. Unlike Android, the scanning operation cannot be forced on Windows devices immediately, as it has a 60 minutes communication interval with the server. This communication interval cannot be customized, it varies from device to device. So scanning will take place only when the device interacts with the server next. Remote Alarm: You can trigger an alarm on the mobile device if it is lost or stolen. It sounds an alarm even if the device is in silent mode. The alarm will stop ringing only when the device is unlocked. This feature is applicable only for Android and Windows devices. Complete Wipe: All the data in the device will be completely wiped out. The device will become as good as new one. You can also wipe all the data from the SD card, for SAFE and KNOX devices. In case of Windows device, this action will be performed only when the device contacts the Mobile Device Manager Plus server. Corporate or Selective Wipe : All the profiles and Apps that were installed using Mobile Device Manager Plus will be wiped out (applicable for iOS, SAFE, KNOX and Windows devices, in case of Android devices other than SAFE and KNOX, only profiles will be removed not the Apps). This will not disturb any personal data other than the corporate data which has been distributed through Mobile Device Manager Plus. This device will no longer be managed by Mobile Device Manager Plus. In case of Windows device, this action will be performed only when the device contacts the Mobile Device Manager Plus server. Clearing the passcode : In case of forgotten password, prompting for password option can be cleared completely. End user can reset a passcode of his choice. If a passcode policy is applied to the device, then the end user will be forced to reset a passcode. This feature is not supported for Windows devices. Reset Passcode : You can reset the passcode of the managed Android device, using this command. The new passcode should meet all the complexity criteria set for the device, if it does not meet the complexity level, then the password reset will fail. So, it is better to set a password with maximum complexity level. If no passcode was set, then a new passcode will be set to the device. This is applicable for Android and Windows devices. For Android devices, you can specify the new passcode to be set to the device and choose to send a notification mail to the user. In case of Windows devices, the new passcode will be generated by the device itself. You can then choose to obtain the new passcode of a particular user's device by mail. Create Container: You can select this command to distribute KNOX License and create a KNOX Container within a KNOX supported device for advanced management activities. Remove Container: The KNOX Container created in the device can be removed by executing this command. This will also revoke the KNOX license distributed to the device. Lock Container: You can lock the KNOX Container and restrict the user's entry into the container for security reasons. Unlock Container: You can execute this command to unlock the already locked container. This will permit users to access the KNOX Container. Reset Passcode: You can reset the passcode of the KNOX Container, using this command. The new passcode should meet all the complexity criteria set for the container, if it does not meet the complexity level, then the password reset will fail. So, it is better to set a password with maximum complexity level. Click on the concern device under Device Name. Click on the Action Button which is located at the right side, and select the action that needs to be done. Due to security reasons, you will be prompted to enter your password to authenticate the action that needs to be performed. Specified Security command will be executed and the status will be reported under Device Details.